The linen closet is one of my home’s biggest organizational downfalls. And what’s worse it’s located in the guest bathroom which means there’s no hiding the chaos. So with my mini bathroom makeover complete it was time to tackle the linen closet. Break out the baskets. Baskets are the fastest way to keep your linen closet organized, towels folded and bedding from falling off the shelves. I chose a combination of woven and wire, the wire for holding items I use frequently and like to see like bath and beach towels. And larger woven baskets for bedding and smaller woven baskets for cleaning supplies, bathroom necessities and everything you need to cure a cough or bandage a wound. Label, label, label. Baskets may be one of my favorite ways to organize, but sometimes it’s hard to see what they’re holding. An easy solution is to group similar items together in each basket and label with a handwritten tag. 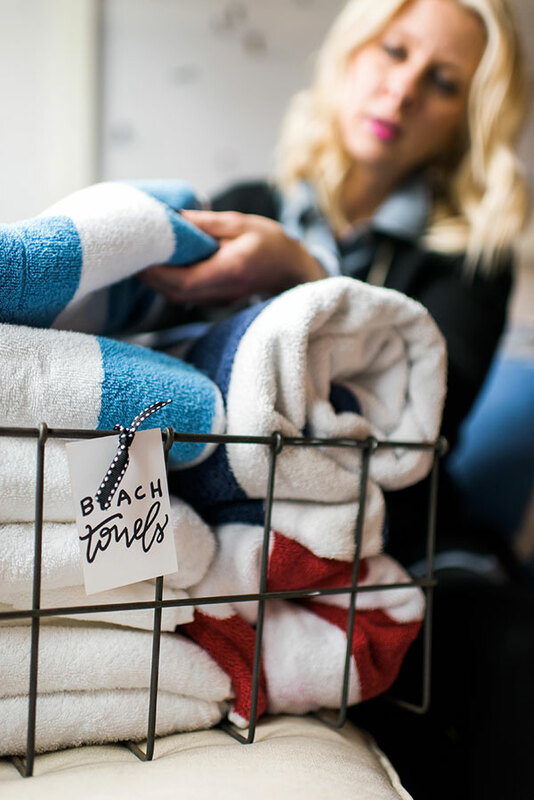 The tags provide that extra dose of OCD pretty and I even added a few that say “help yourself” so guests feel at ease when grabbing a towel or toothbrush. Something about my linen closet has never been super organized. Every other cabinet in my house is though. Definitely some great inspiration! I use a couple World Market baskets (www.worldmarket.com/product/charlotte-lined-wire-baskets.do?&refType=&from=Search) in my bedroom to hold seasonal sweaters in. Pretty & functional! This is beautiful, but my linen closet is a TRIANGLE. The way the hall way is laid out, the two bedroom doors are on an angle and the linen closet in the hall becomes triangle shaped. It’s the worst. Right now i’m rolling the extra towels I keep in there (I don’t put anything else in it really) and I just stay out of that closet. Hi! Love the labels you made. Is it possible to order some from you? I have terrible handwriting so I’d never be able to make them look as nice. Love the way you’ve done this organization. I use baskets in both wire and grass. But they can be pricey so it’s something I’m building upon.